Facebook is one of the fastest growing FREE Social Media Opportunities at your disposal to gain visibility and thus more bookings for your business. (And YES! 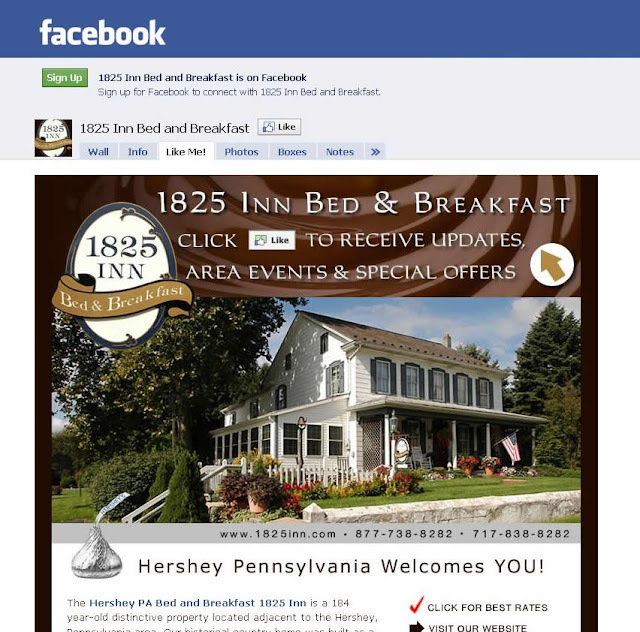 We have proof that Facebook is delivering Bookings to our clients!) The question is, when a potential guest sees your Facebook Business page, do they say WOW? Or do you look pretty much like everyone else out there? 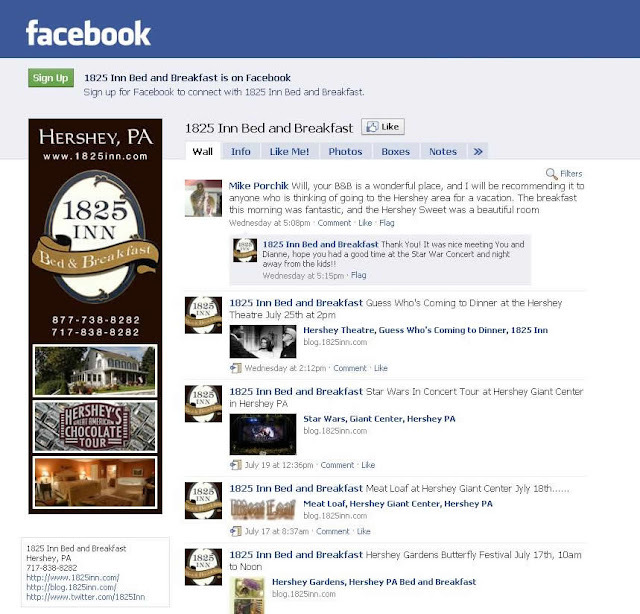 Consider how the following changes to your Facebook Business Account could help you gain followers, and increase business simply by allowing your Inn to stand out! A Customized Landing Page is designed to WELCOME or invite visitors to “LIKE” you. This page is created to include all your unique offerings, connections to other Social Media Links such as Twitter, your Blog, Availability and Reservations, Links to your Specials, Newsletter Signup, Gift Certificates, Gift Shop and More. JUST LIKE MAGIC … Instant FREE viral advertising! Beyond the Customized Landing Page, we carry your look and feel over to the maximum size image allowed on your wall (upper left hand corner). We use this visual opportunity to capture your visitors attention, again encouraging them to “LIKE” you and thus create an opportunity for you to provide information to this follower regarding your Inn and happenings in the area. 3 – Call to Action: Sell, Sell, Sell! Don’t forget to make sure you include either an “Expedia Like” Plug-in or an “Image Button” directly to your Availability System Calendar. Note: Webervations is the only system we see working at the moment with the Plug-in. We will create an “Availability Button” that is coded to go directly to your Availability Page. 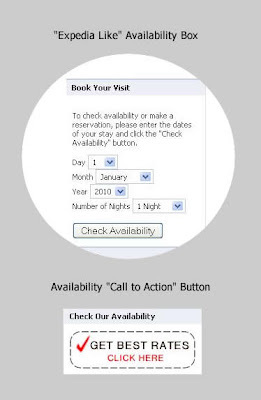 You might also decide you want to feature your Availability on it’s own Page including a TAB at the top of the screen. 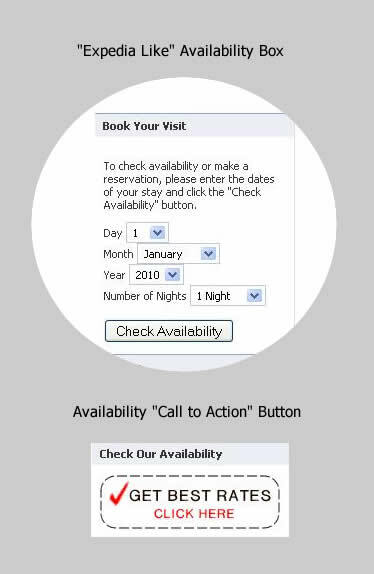 This is a great idea if you are able to get the “Expedia Like” Plug-in to work, but don’t create this page in lieu of placing a “Availability Call to Action” directly on the wall in the left hand column. Remember: Not all surfers click TABS, but if they are visiting your wall, they can’t help but SEE IT! 4 – Call to Action for More! What is More? Newsletter Sign-up, Blog Sign-up, Booking Marking to your Specials Page, if you can think it up, we can add a Button to support it on your wall! Whatever is important to your business, use the Wall (left hand column) to share it. And again, you can also use this opportunity to create a separate page along with a TAB at the top of the screen to push what makes you Inn a special experience. Again, remember if you create a separate page for these sales tools, always put it on the Wall also. 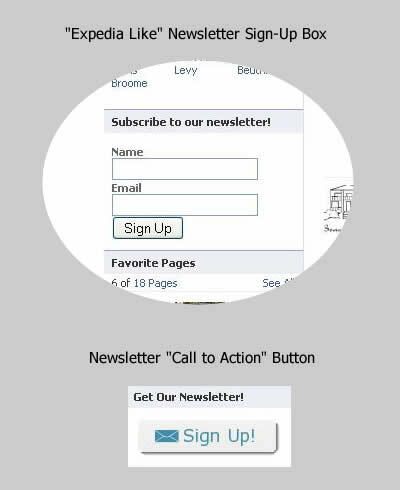 To the right you will see a sample of both an “Expedia Like Box” and also an Image Button “Call to Action” for Newsletter Sign-up. These “Call to Actions” are located on the wall in the left hand column. Either way you choose to do this, a visitor can easily make the choice to Sign-up because you’ve provided them that opportunity at their finger tips. If you want to learn more how Facebook can help you with your business, please plan to attend our Facebook WEBinar scheduled for August 17, 2010. E-Mail Annie Buck to get started! This entry was posted in facebook by admin. Bookmark the permalink. I'm not sure a Welcome page is best? As a user I don't want to go to a business page and instead of seeing a conversation about the business I'm presented with a 'buy me', 'try me', 'like me' selling page. I haven't seen anything but self serving ads yet so why would I want to 'like you' now. It makes me feel like I've gone to their website which is not what I wanted. For me, it's a negative experience. Perhaps a better solution is to use a portion of the customized wall image to request people to like you. For me right now, it bears watching to see how the Facebook community accepts Welcome pages.